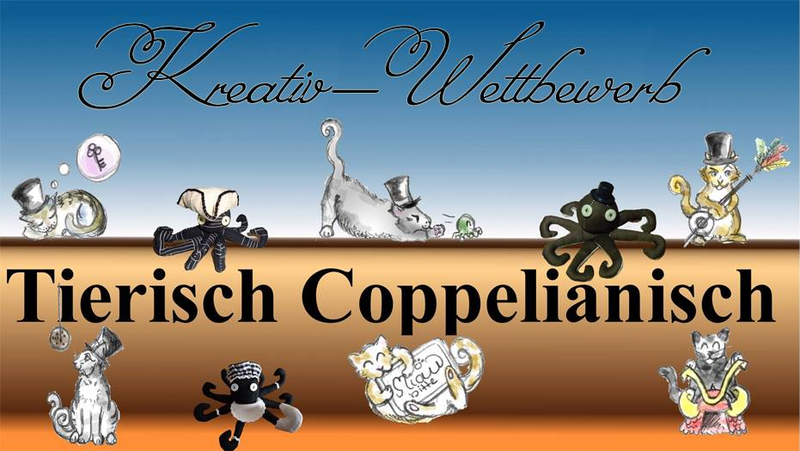 For your pleasure and to shorten this concert free period, the Geheime coppelianische Straßenbaugesellschaft organises a contest for everyone who is creative. With the slogan ‘Tierisch Coppelianisch’ (Beastly coppelianic) we are on the search for your best ideas. Drawings, sculptures, or handmade works, but also texts, videos or pictures are welcome. What is liked the most, wins. - The three contributions that get the most votes, will win wonderful, marvellous prizes and are going to be honoured and praised in the Käseblatt and at the blog! - The nice prizes you can win, are going to be announced later on at this spot. But first we want to give away that it could be interesting to already have a look at the Krämerladen. Maybe you will discover the crown jewel, that is still missing in your collection. - Please be aware that you don’t violate the rules on copyright, both concerning image and sound, when you create your contribution. *All the participants of the contest can of course accept their prizes, except the participants, who already have unlimited access ,because of job or family related reasons, to the items that can be found at the Krämerladen. In this special case, prizes won by participants as described above, will be given to the participant placed next in the ranking.